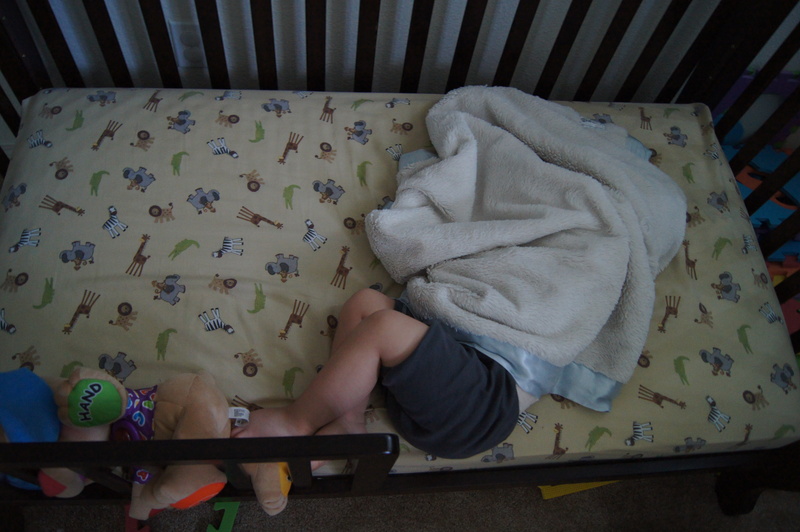 One of our spring break goals was to get Sam into his toddler bed. 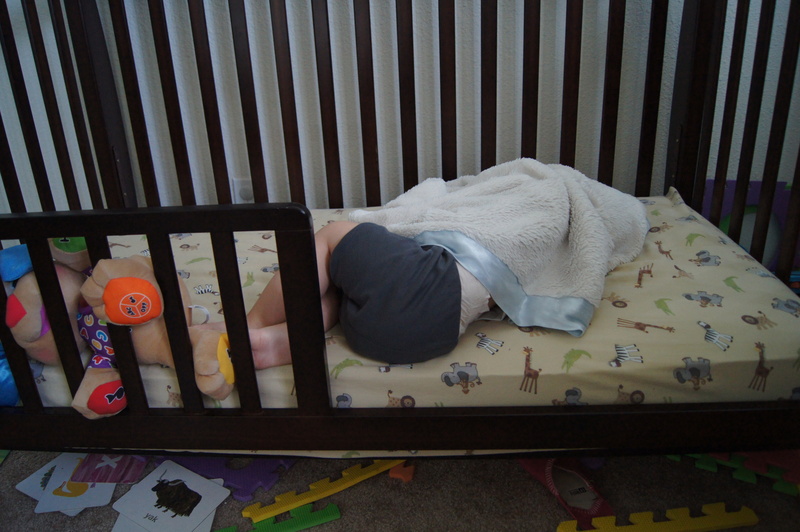 We’d heard some horror stories about newly crib-free toddlers sneaking out of their beds in the middle of the night and waking everyone up. We were prepared for some interrupted sleep and a cranky little boy. 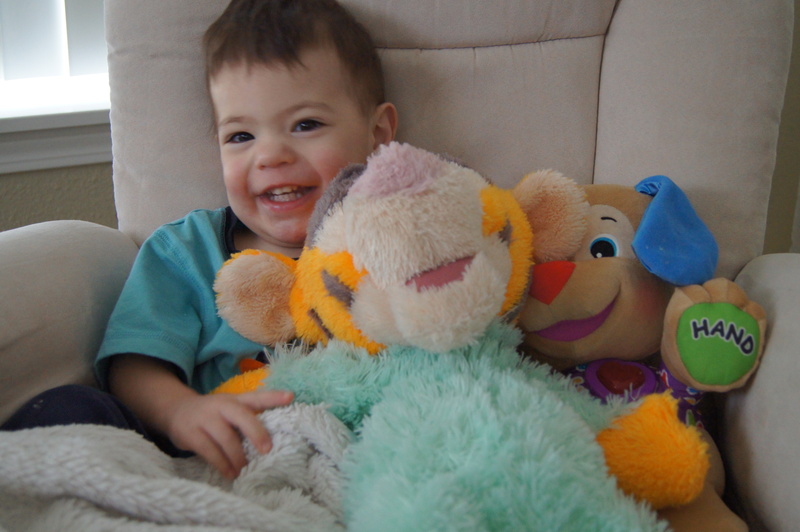 When we told Sam to go to bed on the first night, he just climbed into the bed, pulled his blanket over himself, and asked for his favorite goodnight song (you are my sunshine). He stayed in bed all night. We were all feeling pretty good about this big boy bed! On the second night, I was pleased when Sam didn’t complain about bedtime like he usually does. We walked upstairs and he got into bed without complaining. I left the room, closing the door behind me. I went down the hall to use the restroom, and on my way back I was shocked to see Sam’s door wide open. He had let himself out of his room and made it almost all the way down the stairs. He was so quiet about it that Dave didn’t even hear him coming down the staircase. We put a child-proof doorknob cover on the door right away, and we haven’t had any problems since. 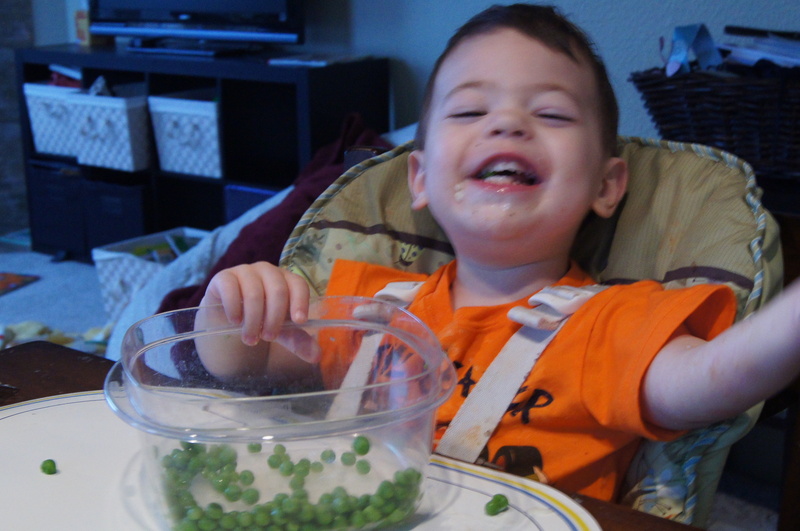 Dinner tonight was meat, mashed potatoes, and peas. 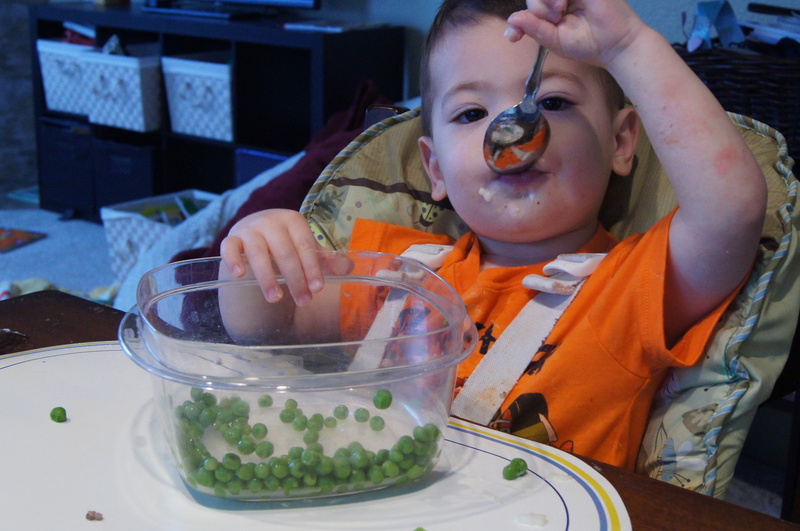 Sam is a good eater, but he never touches mashed potatoes. We continue to serve them to him anyway, just in case he changes his mind. Daycare has been a really good experience this year for Sam. 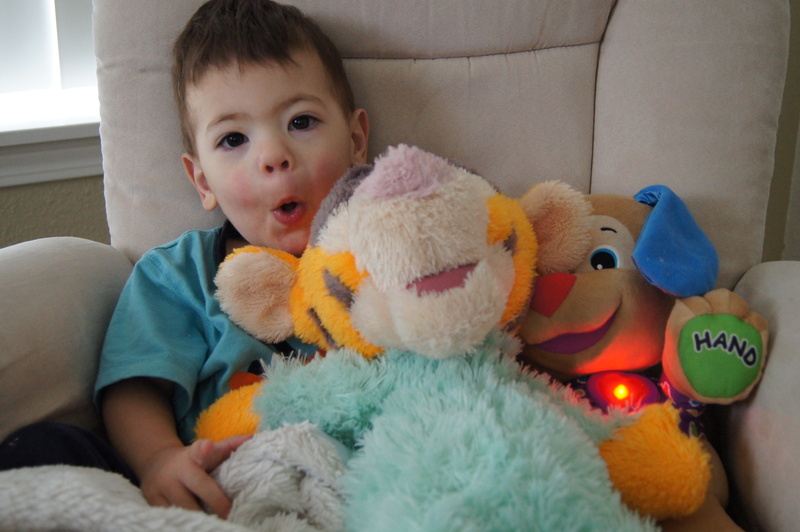 He loves playing with his friends and doing circle time activities like ribbon dancing. Best of all, though, are the crafts. Sam’s school has a new craft for the kids to do every single day. They paint, glue things together, and decorate pictures with feathers, glitter, and stickers. Sam loves doing these activities. The first time he painted at school, he spent 45 minutes on his creation. His teacher said she’d never seen a child paint for so long! This week, our fun plans were derailed a bit by another case of pink eye. Since we were stuck indoors, I decided to get some finger paints for our little guy. There are a couple of videos below. The second one is extremely long. I won’t feel bad if no one watches it! Here are the promised videos! I’m starting the first day of my glorious 2 week vacation today. Sam and I are going to spend our days doing all of the things we can’t do while school is in session. Today, we decided to try out chocolate-covered banana bites, a recipe in a cookbook that Sam got for his birthday. Sam helped me chop the bananas and roll the chocolate-covered bananas in coconut and sprinkles. I took a couple of videos of Sam in action. Those will be posted soon! Sam came up with a new game this afternoon. He brings one of us a pillow and says “throw it!” He then runs away while we try to hit him with the pillow. This video is great for two reasons: 1. Sam is having SO much fun with his dad, and 2. he’s wearing a dinosaur shirt and cape with yellow rain boots. It’s so good that I’ll post it online even though I’m really embarrassed by our messy kitchen. We woke up to another winter wonderland this morning. Even though I’m ready for the snow to stop coming this year, I still think it’s beautiful. That’s not what Sam thinks, however. He looked out the window this morning and said “dirty.” “Dirty cars, dirty trucks, dirty trees”. 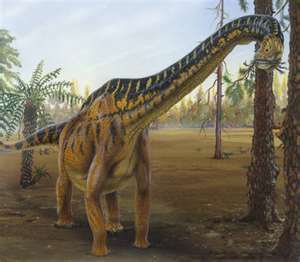 Yesterday, while looking at pictures of dinosaurs, Sam pointed to the brachiosaurus and said “Sam! Sam!” He did it again this morning while looking at the book with his dad. We thought it was pretty strange, so I told his day care teacher about it. She wasn’t surprised at all. For the last month, they’ve been focusing on using their imaginations. As part of this experience, they’ve been reading a book about animals. Each page has many animals, so she’s taken to pointing at one and saying, “that’s Kashyapi”, or “that’s Sam”. Sam’s animal in that book is the lion. Apparently Sam thougth it was great fun to imagine himself as a lion. Now he’s imagining himself as a brachiosaurus.